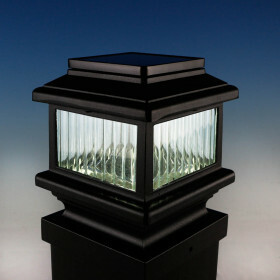 Add a touch of style to your posts with the Colonial Solar Post Cap Light by Classy Caps. This cap fits perfectly over a 3-1/2" wood post. Two high-quality LED bulbs in each cap stay lit for up to 8 hours, and the durable cast aluminum assembly will retain its color and beauty for years to come. 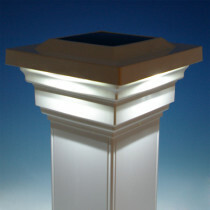 Post Cap Opening Size 4-1/32"
(width x depth x height) 6-1/8" x 6-1/8" x 5-1/4"
By using a solar panel to convert sunlight into electricity, solar lighting is preferred in situations where wiring is not a practical option. 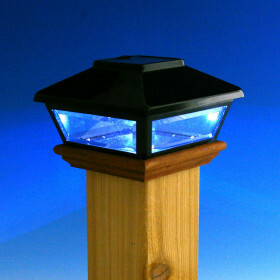 It doesn’t produce as much light as low voltage and line voltage power, so it’s most often used to create accent lights. The LED bulbs are fueled by rechargeable NiCad (Nickel Cadmium) batteries which require sunlight, with charging and run times based on the season and location. 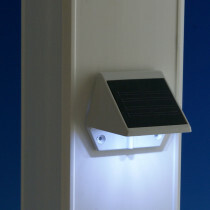 For example, solar lights in northern climates will run 8-12 hours in the summer and 3-6 hours in the winter, while in southern climates, the same lights will run even longer with greater sun exposure.